Do you want to be rich? Do you want to be successful creating something on your own? Become boss of a company with many employees? In one word, do you dream of becoming a great entrepreneur? Here, this is the book for you. Written by a true entrepreneur, this book will give you an emotional jolt in motivational terms, baring you to make you understand who you are and what you really want. After he has get you going and motivated as a true coach, the author will explain in detail tricks and secrets to create a successful business from scratch. Then, after he revealed all the secrets of the greatest entrepreneurs of the last generation, to ensure that you will get inspiration, he will give you a number of entrepreneurial potentially millionaire ideas that you'll have only to start. Ultimately, if you are a person with positive and optimistic nature, if you have a dream and want to achieve it, in this book you'll find a guide and a beacon to keep always by your side.
. how to interpret the future creating new people's needs. 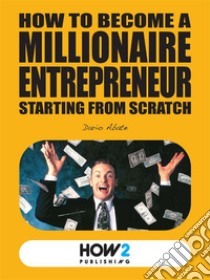 In conclusion: if a book to become rich, wishful thinker, resourceful exists... it's this one.